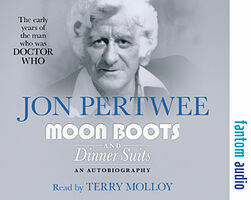 Note: Abridged audio reading of Jon Pertwee's autobiography. Also released as part of The Three Doctors box set. In 1938 came Jon's first radio role in the BBC's Lillibulero, in which year he also appeared in his father's play, To Kill a Cat, directed by Henry Kendall at the Aldwych Theatre. When war came he joined the Navy, ramming Douglas Pier with an Isle of Man Steam Packet boat. He was blown up twice, once being put on a marble slab presumed dead, and spent many months stationed in the Scapa Flow. He was the founder of the Service Players in the Isle of Man. He was commissioned in the RNVR and transferred to Naval Intelligence where he worked and became good friends with the future Prime Minister James Callaghan. Then Jon joined Naval Broadcasting. His radio series, The Navy Lark, ran for eighteen years and produced some truly vintage memories of radio.